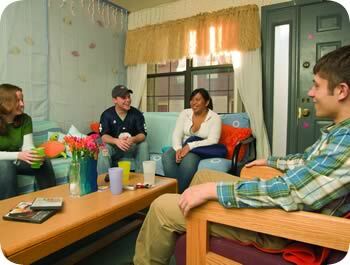 La Salle University believes that residential living is a valuable way for students to experience what it means to live as part of a broader community; students begin to understand themselves and the dynamic of living with others throughout this unique experience. Students who live within a campus community are generally more likely to be involved in campus life, join student organizations, become involved in student government, and have greater opportunities to interact with faculty. In fact, higher education research validates that students who reside within the campus community tend to be more successful and are more likely to graduate from college. All full-time undergraduate students are required to live in University housing and participate in a University Dining Services meal plan throughout their first (freshmen) and second (sophomore) years at the University, unless living with parents or a legal guardian. All students will be required to comply starting the 2015-2016 academic year. Reside with a parent or legal guardian. Are 21 years of age or older prior to the start date of the housing contract. Are military veterans who have had active duty service. If a first (freshmen) or second (sophomore) year undergraduate student chooses to live off-campus, and does not meet the one of the above exceptions, they will be billed a standard double room rate along with the default meal plan for resident students for the Fall and Spring semesters. All students should maintain and submit accurate information regarding their residence on or off campus. As part of your confirmation of acceptance to the University, your selection of “Resident” or “Commuter” acknowledges your intention and compliance with the Required Residency Policy. New students, please update any changes to your parent or legal guardian’s address and/or your permanent home address with Undergraduate Admission. After registering for classes, you will be asked to submit a form online indicating if you will be living on- or off-campus. If on-campus, you will be directed to the Housing Application. You may also access the form directly here after the start of class registration. Returning students, please update any changes to your parent or legal guardian’s address and/or your permanent home address with the Registrar’s Office.